I’ve talked about the importance of Google+ presence and authorship in my past blogs. What I’m about to discuss today shows the continued importance and effectiveness of Google+ in increasing your trust signals and putting you on the SERPs. A recent study released by SEO tools provider Conductor shows that Google+ presence has increased considerably between January of the previous year and May of the current year. 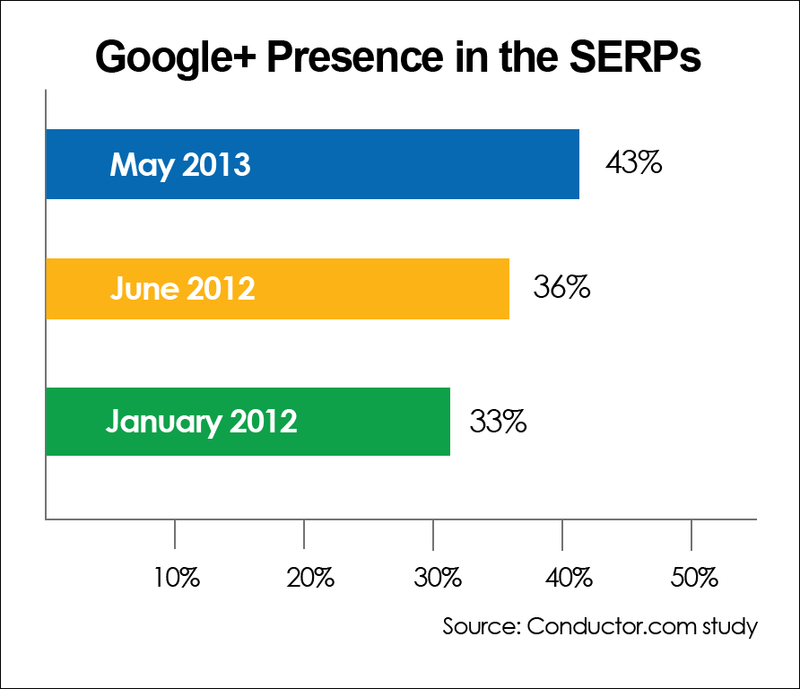 The study shows that as of May 2013, 43% of personal brand searches on the first page of the SERPs have Google+ presence. This increase follows the initial increase from January 2012’s 33% to June 2012’s 36%. Looking at the results of the study, you can see a direct relationship between the number of people now implementing authorship and the increase in Google+ presence in the SERPs. The announcement given earlier this year has increased the demand for Google+ optimization and authorship implementation, because now your market knows that it will help boost them up on the SERPs. Another benefit comes from Google ranking your G+ posts as part of organic search results. This is very helpful if you’re trying to rank your content for more competitive industry keywords. Finally, it makes your listing offer more trust signals, with the G+ profile pic and rich snippets appearing alongside the content you publish. A very important note: the study looks at personal brand searches, not company results. You may use authorship mark-up if your business page is verified by Google, which means Google already sees you enough as authoritative enough. The results of this study is relevant if you are trying to build up authority for you as your brand ambassador, or if you’re trying to build up one of your clients as a personal brand. Contact your account manager today to start implementing the appropriate mark-ups and optimize your own and your clients’ Google+ profiles. Sign up free and become our partner to get started. Keep checking back for more updates! Will Guest Blogging be Considered Spam in the Future?